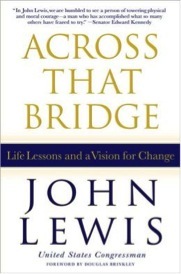 The most inspiring book I read in 2013 was Across that Bridge: Life Lessons and A Vision for Change, by Congressman and Civil Rights legend, John Lewis. He built the book around several practices that are essential for social justice work: faith, patience, study, truth, peace, love and reconciliation. I hope that these words of Congressman Lewis, plus the introductory quotes for each chapter will whet your appetite for the whole book.